Lazy Summer Morning Routine/Essentials | RAWR BOWS. Hello! I am sure I'm not the only one who looooves being lazy in summer. There's nothing better than waking up at any time you want and knowing you have absolutely nothing planned or get done that day. 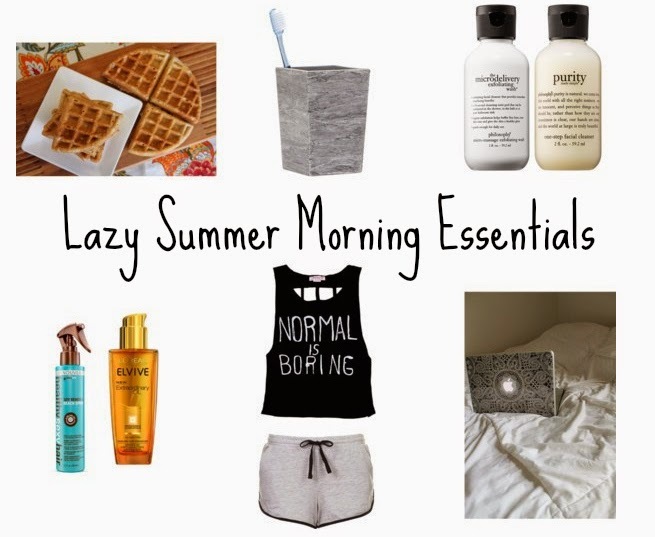 Some of my essentials for a lazy morning in summer are the ones above. The first thing I always do when I wake up regardless of the time of the year is have breakfast, I need to eat something before even checking my phone (which I normally do while I eat). I then go to my bathroom and try to take care of my teeth so that they look decent and I don't have to go to the dentist too often (after all, who likes going to the dentist?). Since it's summer I take extra care of my skin and hair basically because I spend quite a lot of time under the sun and getting sunburnt is not nice. I also like to spray oil on my hair to protect it from the sun. I then decide I should probably get dressed and as it's been extremely hot lately, like, not even nicely hot just disgustingly hot and humid, I try to wear simple outfits that don't make make me sweat like a pig. I normally go for runner shorts and a loose tank top. Aaaand, it's laptop time!! And because it's a lazy morning (or day, or week or even month) you are allowed to spend as much time as you wish stalking people on Twitter, expressing your love for Netflix, planning your own wedding on Pinterest or just procrastinating on Tumblr. What's your favourite to do when you're being lazy?